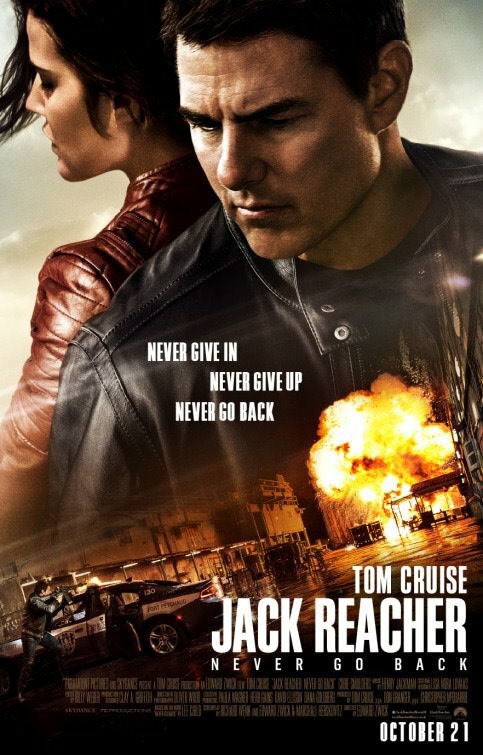 After Jack Reacher was first introduced to cinema audiences in 2012, the first film simply titled Jack Reacher featured an all-star cast including Oscar nominee Rosamund Pike, Werner Herzog and David Oyelowo and of course superstar Tom Cruise in the titular role. While the first film had a brilliant cast, this sequel seems to be less concerned with attracting big stars and rather making Jack Reacher: Never Go Back another Tom Cruise action film. Tom Cruise (Mission Impossible, Top Gun) returns in this stand-alone sequel mainly set in Washington D.C. and New Orleans. He stars opposite Canadian star Cobie Smulders of How I met Your Mother TV fame as Captain Susan Turner. Smulders (The Avengers: Age of Ultron) turns in a solid performance as the no-nonsense Captain Turner who is inadvertently arrested after two of her officers are killed in Afghanistan under mysterious circumstances. 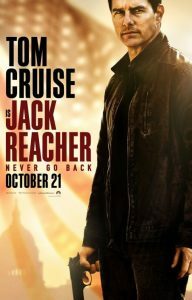 Naturally it’s the everyman’s hero, one who has no flashy cars or gadgets, Jack Reacher who comes to the rescue breaking Turner out of a military prison whereby they embark on a quest to uncover the truth behind a shady private military contractor Parasol, represented by the villainous Robert Knepper of Prison Break TV fame. In the process Reacher, a character based on a series of novels by Lee Child, discovers through a paternity suit filed against him, that he may have a teenage daughter, the Blonde haired and skilful Samantha, a suitably wilful performance by Danika Yarosh who soon forms a close bond with Reacher and Turner as they escape the American capital and head for Louisiana. Close on their tail is a merciless assassin, The Hunter played by Patrick Heusinger (Black Swan) who ruthlessly hunts the trio to the Mardi Gras capital of America. As the conspiracy deepens and the body count rises, Jack Reacher: Never Go Back becomes an absorbing and fast-paced thriller with loads of action skilfully directed by Edward Zwick, an accomplished American filmmaker responsible for films like Glory, Pawn Sacrifice and Blood Diamond. While this film is not as good as the brilliant original film, Jack Reacher directed by Christopher McQuarrie it certainly will stand up as a continuation of another action franchise for Tom Cruise who inhabits the role of Reacher with ease and confidence.